Science and religion both contribute to ways of making sense of the world. With different areas of focus, these can be seen as separate realms. But with overlap in framing a sense of what seems real, people who lean toward one need to reckon with the other. Science is a method for examining how things are. It requires evidence and tests for things to be accepted as true. A focus in religion is what matters. It affirms values, encourages community, and gives recommendations on how to live. Religions, for the most part, respect the scientific method. But, for things that are unable to be known, holy books, tradition, and church leaders are respected as sources of truth and, when beliefs are challenged, faith is respected. Religion and science complement each other, in contributing things the other does not offer. But, they can also conflict as religion overlaps with science in making claims about how things are, with beliefs that, with the eyes of science, seem impossible. In Jewish and Christian traditions, this includes a view of God as a personal presence that may cause events in the world. It may also include an immortal soul, virgin birth, and other things can’t be squared with natural laws. Some avoid thinking about these topics. Some remain undecided. But, where science-based and religious beliefs contradict each other, there is no honest middle ground. It’s not possible to prove or disprove either position. So belief is based on gut feeling – that either a science-based naturalist/atheist view or an active personal God is true. Both sides include those who defend their approach by downplaying the value of the other. The least thoughtful of these simply reject the other position, where strident atheists see all religion as irrational and primitive and fundamentalist believers look at science as irrelevant or wrong. A softer approach is to highlight real limits – that some aspects of religions have had harmful effects and that science is unable to explain a number of things. Both sides also include approaches to try to reconcile these views. For many with Jewish and Christian belief, biblical miracles are understood as symbol or myth and evolution is wholly accepted. God is not seen as something apart from nature, but instead is the foundation of nature. Scientific study has shown types of needs religions address. It has also shown, with scientific standards for proof, ways that aspects of religion may contribute to well-being. 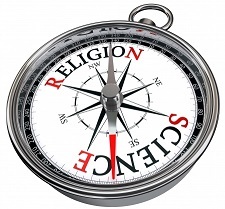 With appreciation for how symbols can help in grappling with complex issues, and with an understanding of benefits that religion may offer, religious naturalism gives ways of using a worldview grounded in science as a foundation for personal religion.